Many churches have a practice of giving a Bible to a child or to a family. The most common occasion is the beginning of the school year when a child is entering second or third grade. This recognizes their growing ability to read and comprehend stories. Then often a second Bible is given to a teenager at either the beginning or completion of confirmation. Less common is the giving of a Bible storybook appropriate for very young children, which some congregations give at birth/adoption or at baptism or dedication. Sometimes these important practices need some reconsideration and updating. Here are some suggestions to consider as you review the tradition of your congregation. Candle Read and Share Bible (UK: Thomas Nelson, 2007) has included 208 “bite-size Stories”. Children of God, Storybook Bible by Archbishop Desmond Tutu (Grand Rapids: Zonderkidz, 2010). Each story has a prayer. Different illustrators are used. Deluxe edition includes a CD with Tutu reading the stories. Bible Animal Stories for Bedtime by Jane Landreth (Barbour Publishing, 2011), includes 39 stories from the Old Testament and 22 from the New Testament. Each story includes a simple prayer and the pictures of children are very diverse, which is really a good thing! She has also written Bible Prayers for Bedtime (Barbour Publishing, 2008). I found these on a rack at the grocery store! The Children’s Everyday Bible (NY: DK Publishing, 2001) includes one story for every day of the year, 193 from the Old Testament and 172 from the New Testament. The Lion Read and Know Bible (UK: Lion Children’s Books, 2008) includes 25 stories from the Old Testament and 24 from the New Testament. Shine On, A Story Bible (Elgin, IL: Brethren Press, 2014). Has wonderful illustrations by a variety of artists and includes three questions with each story to help children wonder, connect, and explore. The Deep Blue Bible Storybook (Nashville: Cokesbury, 2016) tells familiar Bible stories used in church school and includes a question for children to think about. Deep Blue Kid’s Bible (Common English Bible, 2012) is a children’s version of the newest Bible to be translated, The Common English Bible. It includes helpful notes appropriate for this age group and an introduction to each book of the Bible. If you want a Bible to give to elementary age children, give this one. The translation is at an 8th grade reading level (NRSV is 11th grade). The notes and helps for children as well as the illustrations help children and parents as they move more deeply into the richness and diversity of the stories and books in the Bible. The Children’s Illustrated Bible (DK Publishing, 2005). This is a great resource to have at home because of all the sidebar historical information that is made available as background for the stories. The CEB Student Bible (Nashville: Common English Bible, 2015) is the best choice, again because of the age appropriate notes and prayers. The contributions, written by adults and youth, make this the most accessible Bible for teenagers and emerging young adults. If you are giving a Bible storybook to a family with a baby or young child, it could be taken to the family at home. Consider inviting a child to go with you! Along with the Bible storybook, consider taking a small booklet or laminate a card with suggestions for when and how adults might begin reading the Bible storybook with their child. Give a copy of the Deep Blue Kids Bible to third graders. There are varieties of covers (paper, hardback, leather) and prices that are available on www.commonenglishbible.com website. Make it a special event in worship as—the beginning of the school year. Schedule it after the offering in response to the Word having been read and preached. Invite members of the congregation—older/middle aged/young adults, teenagers—one for each child to present the Bibles to these children. Invite each presenter to tell the child their favorite story or verse in the Bible. Support families by offering a 45–60 minute workshop for parents or family members and the child who is receiving the Bible. It could be scheduled during the church school hour on Sunday morning, after worship with lunch, or during the week. At this workshop, introduce the Deep Blue Kids Bible and its resources to the children and adults. Parents may also be interested in seeing the Deep Blue Kids Bible App. Become familiar with the organization. Look at contents and Bible basics. Meet the Deep Blue Crew—Asia, Kat and Edgar and discover their roles. Point out the in-text notes and invite children to find one and read it. Discuss how and when to read Bible stories as a family. Have sticky notes available for marking the stories that will be explored in church school on Sunday morning. Where is there a story about a prophet? Find a story about a woman named Esther. Who visited Jesus after he was born? Where is that story? If you want to read a poem, what book would you look for? Find one picture you like and tell why you chose it. Lisa Miller, The Spiritual Child, The New Science on Parenting for Health and Lifelong Thriving, New York: St. Martins Press, 2015. Elizabeth F. Caldwell, I Wonder, Engaging a Child’s Curiosity about the Bible, Nashville: Abingdon Press, 2016. The Rev. Dr. Elizabeth Caldwell (known to most as Lib) is Professor Emerita of McCormick Theological Seminary in Chicago. 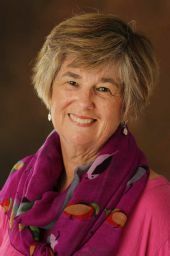 After failing retirement, she teaches as Adjunct Faculty at Vanderbilt Divinity School, serves as consultant and writer for Growing in Grace and Gratitude curriculum, and works on writing projects. She also saves time for quilting and gardening with her husband.